Posh director of football Barry Fry (left) with chairman Darragh MacAnthony. Peterborough United will vote against radical proposals to shake up the structure of the Football League, unless considerable financial compensation is forthcoming. Posh director of football Barry Fry, who will attend the annual general meeting of the Football League in Portugal next month, is adamant there is no chance of the proposals passing without a financial commitment from the Premier League. A briefing document sent out by the Football League - with the backing of all-powerful Premier League chief Richard Scudamore - proposes the reduction of all Football League divisions from 24 teams to 20 in line with the Premier League. This would create a fourth Football League division with numbers made up by National League clubs. There would be 100 clubs in the Premier League and Football League structure rather than the current 92. But Fry claims Posh are one of ‘90%’ of clubs who are losing money annually and can’t afford to lose any more. “As things stand there is no chance of this proposal passing,” Fry stated. “Ninety per cent of Football League clubs are losing money so the prospect of losing revenue from having four fewer home games is frightening. “It’s not just match ticket money a club would lose. There is lost revenue from programmes, commercial revenue, catering revenue and match sponsorship revenue to consider. If I had my way we’d play more games, not fewer, just to keep us on a better financial footing. “There is only one way these proposals will pass and that’s with the receipt of proper compensation from the Premier League. At the moment we receive a payment from the Football League every month and a solidarity payment from the Premier League twice a year and if they were adversely affected we would all vote no. A recent survey conducted by the Daily Telegraph after the proposals were revealed suggested the Premier League would have to pay out a total of at least £22 million to cover the expected shortfall and to satisfy the Football League clubs. 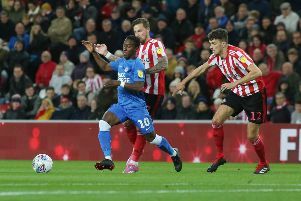 Ninety per cent of Football League clubs will have to vote for the proposals for them to pass - that’s 65 of the 72 clubs in Leagues One, Two and Three. The Premier League are in favour of the changes as it would free up more dates in the calender. Premier League clubs will pay Football League teams £69.6m in solidarity payments this year, £2.3m to each Championships side, and £360,000 and £240,000, respectively to those in Leagues One and Tw0. A switch from three 24-club divisions to four 20-club divisions in line with the Premier League. Increase in number of league clubs from 92 to 100, but cut in number of Football League rounds from 46 to 38. Any changes to be implemented for the start of the 2019-20 season, after current broadcast contracts expire. Promotion and relegation from Premier League to remain three up, three down. No relegation from Football League to National League in 2018-19 season. Plans to be discussed by Football League clubs from next month, with a vote taken no earlier than June 2017. Preferred option is for plan to be introduced in its entirety rather than phased in, meaning one season of mass relegations, including at least 12 clubs from League Two, and potentially the promotion of eight teams from the National League. Change would free up midweek dates, potentially for FA Cup ties, which in turn could release dates for Premier League matches and allow the creation of a winter break. Plan seen as part of solution to fixture congestion and the performance of England’s club and national sides on the global stage.